It was just this past episode of the Digital Strips Podcast (or the one before that, can’t specifically recall which) that Steve and I were wondering what had happened to this instant homerun of a comic concept. The man behind PvP, originally a gaming-centered gag comic, and the creators of Penny Arcade, itself a comic about video games and the culture they encourage, got together (i.e. 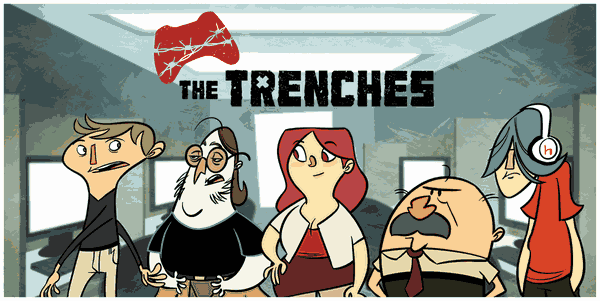 walked down the hall to one another) and came up with another gaming comic idea, this time chronicling the depressing life of a video game tester, and it’s called The Trenches. Remember, that profession that everyone wanted as a kid? Yeah, you don’t want this. It also looks like the blog will feature true horror stories from actual, former testers, so there’s even more to come to the site for than the regular comic update.